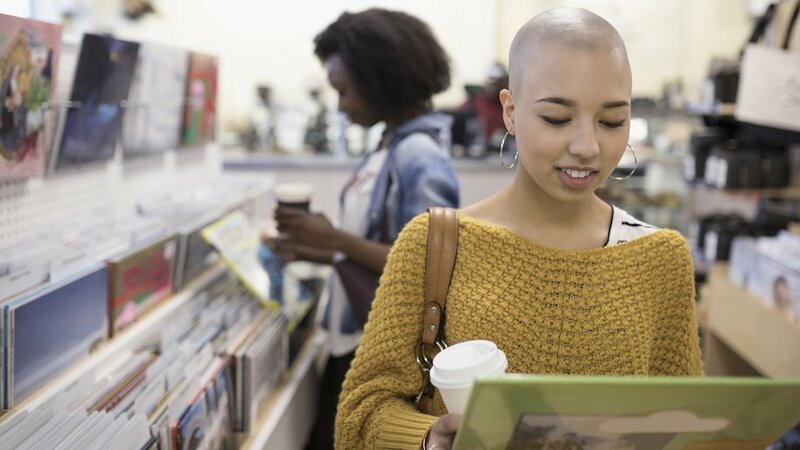 Records and coffee are the hot new pairing in retail. These stores offer a dual-sensory experience: bitter and smooth on the tongue; sweet and soulful for the ears. We surveyed the United States for locations that have capitalized on the perfect coupling of java and music. Founded in Brooklyn circa 2010, Black Gold prides itself on its fresh, hand-poured brew and constantly evolving stock of vinyl. Don’t expect to sit down here; you’re meant to sip and browse simultaneously. Need a way to pay for that premium cup of Joe or much sought-after album? Try hocking your old records; Black Gold buys “desirable titles” at competitive prices. In addition to the caffeine fix and musical titillation, Black Gold’s vintage taxidermy and antique oddities are worth a look-see, too. The shop garnered such a good reputation for its curated music selection and superb customer service it opened a second location in SoHo earlier this year. Most things purple are pretty cool; Purple Llama is no exception. This quaint joint in the Wicker Park area is decked out in purple neon, boasts rotating coffee roasters, and has a wall full of records. Baristas take their jobs seriously here, and treat coffee with the same expertise you’d expect of a sommelier. Popular drinks include the cortados, the oatmilk lattes, and the “Hippy Speedball” (espresso with a side of kombucha). As for records, that’s a matter of personal taste, but you’ll find everything from the Talking Heads to Bobby Womack to Françoise Hardy. Purple Llama also offers a monthly coffee and record subscription service for those times you don’t want to leave the house. Everything old is new again at Easy Street, a nostalgic-rich record shop, coffee bar, and diner. Here you’ll find a huge stock of records, CDs, and even cassettes in addition to a breakfast and lunch café menu with music-themed eats like the “Notorious B&G” (biscuits and gravy), the “Let it BLT” sandwich, or the “Johnny Cash Special” (steak and eggs). It’s been said their bacon is a “spiritual experience,” so don’t let that pass you by. The coffee drinks get the musical treatment, too, with names like “Amazing Grace” and “Mudhoney.” Ticket giveaways, in-store performances, and a website bursting with record recommendations makes Easy Street a veritable authority on all things musical. Caydence Records and Coffee, a cozy neighborhood haunt started by three friends from St. Paul, is heavy on the punk, alternative and metal music beloved by the co-founders. The drink menu offers classic coffee varieties like drip brew, cold brew, black eye, and Americano. Their whipped cream is made in-house, so get a cloud of it on top of your drink if you dare. Sit and sip while watching foot traffic outside or flip through 2,500 new and used LPs or 1,500 used CDs, many of them bargain-priced. Check out the sizable collection of local artwork or, if you’re lucky, catch an intimate, in-store performance. What goes with coffee better than pie? Yes, records, but you can’t eat records. Kate’s Pie Shop Café and Records will hit the sweet spot with a trifecta of awesomeness. Nab an unusual coffee drink like the Black Pepper (espresso and Dr. Pepper) and pair it with a mad delicious slice of Peanut Butter Cookie Pie, Doughnut Pie (yup, it’s a thing), or Black Velvet Pie (created in honor of World Goth Day). Vegan and savory pies also appear on the menu. After you get your coffee and sugar buzzes on, stock up on vintage vinyl in genres as diverse as jazz, indie, and country. This is hipster heaven. If you love the equipment associated with music listening as much as you love the music itself, The Sound Gallery will quickly become a favorite hang. Its selection of new and refurbished stereo equipment is both a reprieve from digital-centric music and a blast from the past. Soak up the knowledge from the music-obsessed staff, enjoy freshly-made espresso, and pick up some vinyl to play on all that enviable equipment you just bought. Hidden gem The Vinyl Street Café is a crate digger’s dream. From Nina Simone to the Fugees or Simon and Garfunkel to Led Zeppelin, there’s something for everyone here. Drink up iced or hot coffee while previewing albums at designated listening stations in the lounge area. When you’ve made your selections, get your picture taken holding your purchase for the shop’s Instagram account where you’ll join dozens of happy customers who’ve shared their stories of the music that’s impacted their lives.